Le CPE a organisé un après-midi de réflexion sur l’avenir de l’auteur au Parlement européen de Bruxelles sous le parrainage et avec la participation des députés européens, Jean-Marie Cavada, Constance Le Grip et Virginie Rozière sous l’intitulé « L’auteur européen dans le XXIe siècle ». 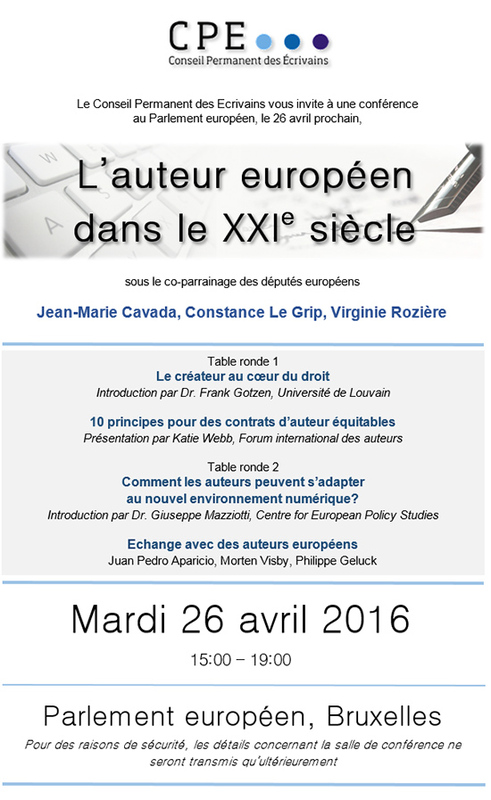 The French Permanent Council of Writers (CPE) organized a half-day meeting on the future of authors at the European Parliament in Brussels, under the patronage and with the participation of MEPs Jean-Marie Cavada, Constance Le Grip and Virginia Rozière, entitled « The European Author in the 21st Century ». A l’occasion de cette journée qui a permis des échanges fructueux, le CPE a formulé « Douze propositions pour une Europe du livre » qu’elle rend publiques aujourd’hui (voir annexe I). Tel est le souhait exprimé par les auteurs européens, représentés à la conférence par Philippe Geluck, Juan Pedro Aparicio, Morten Visby, et par Valentine Goby, Présidente du CPE, dans le texte publié aujourd’hui (voir annexe II). On this occasion, CPE member organizations welcome the convergence of views they have witnessed with the Members of the European Parliament. They also found that the Commission’s plans, as presented by Commissioner Oettinger’s team, do no longer constitute a sudden and unjustified questioning of author’s rights. Under pressure from professional circles, advancement is noticeable from the Juncker Commission, which takes into account the demand for a fair remuneration of authors and the reflection on the responsibility of Net operators in fighting piracy and finding balance in value sharing. Yet, we should remain extremely vigilant and cautious until the proposed reform of the Directive on copyright is released. The CPE also appreciated the firm message brought by Pierre Sellal, Permanent Representative of France to the European Union, who welcomed the CPE’s initiative. He stressed the not only cultural but also economic value of author’s rights and the need for a restrictive interpretation of exceptions to exclusive rights. He called on public authorities to fight effectively against violations of intellectual property. In addition, on the occasion of this meeting that allowed fruitful exchanges, the CPE presented « 12 proposals for a European policy for the book sector », which are made public today (see annex 1). The CPE expresses the hope that the European authorities will take on board these proposals in order to ensure a high-level protection for authors while taking into account the new digital and economic environment. 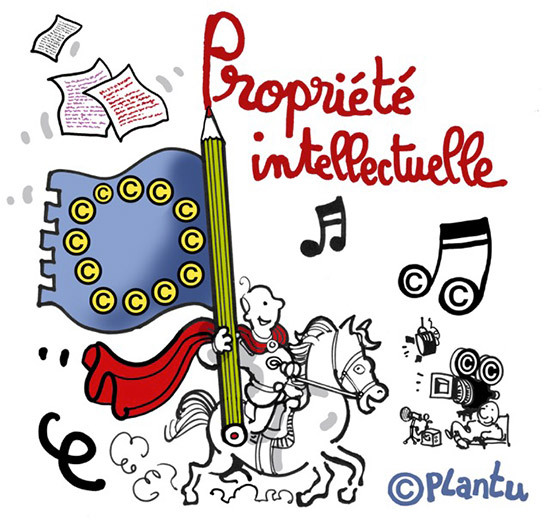 This is also the wish made by European authors, represented at the meeting by Philippe Geluck, Juan Pedro Aparicio, Morten Visby, and by Valentine Goby, President of the CPE, in the text released today (see annex 2).